Sequel to the Hit Novel, Monster Hunter International. Owen Pitt Never Met a Gun He Didn’t Like, or a Monster He Couldn’t Shoot. But Now, the Monsters are Shooting Back . 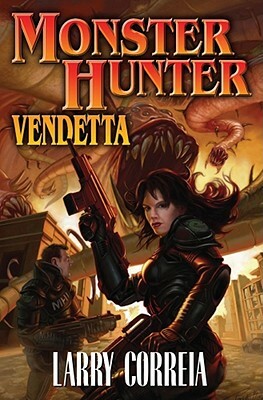 . .
With supernatural assassins targeting his family, a spy in their midst, and horrific beasties lurking around every corner, Owen and the staff of Monster Hunter International don’t need to go hunting, because this time the monsters are hunting them. Fortunately, this bait is armed and very dangerous . . .
Larry Correia is hopelessly addicted to two things: guns and B-horror movies. He has been a gun dealer, firearms instructor, accountant, and is now a very successful writer. He shoots competitively and is a certified concealed weapons instructor. Larry resides in Utah with his very patient wife and family. His first novel, Monster Hunter International is now in its third printing.